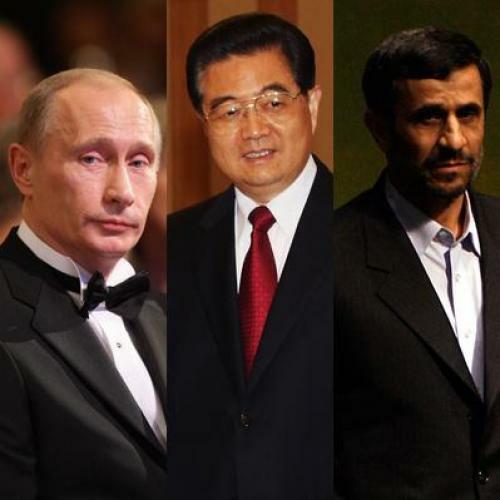 The real reason why Russia and China aren’t interested in stopping Iran’s nuclear program. As President Obama begins a push to impose harsher economic sanctions on Iran over its nuclear program, his success will be determined largely by the answer to a single question: Will China and Russia get on board? In order to bite, sanctions must be enforced by the rest of the international community, but, so far, Beijing and Moscow have been reluctant to endorse the toughest penalties advocated by Washington. Many analysts and policymakers wrongly assume that this reluctance is a function of these countries’ economic ties with Iran, or their failure to appreciate the proliferation threat. Last week, for example, Hillary Clinton bluntly challenged China’s approach to Tehran, saying, “[W]e understand that right now it seems counterproductive to you to sanction a country from which you get so much of the natural resources your growing economy needs. But think about the longer term implications.” The real reason for Beijing and Moscow’s obstinacy, however, is much more fundamental, and from Washington’s point of view, much more distressing: China and Russia are not particularly threatened by, and may even see a significant upside to, a nuclear-armed Iran. To understand this point, we must first consider why the United States, China, and Russia--or any other country for that matter--should fear nuclear proliferation. Of course, there are the concerns of accidental nuclear detonation, nuclear terrorism, or even nuclear war. But these are all extremely low probability events. The primary threat of nuclear proliferation is that it constrains the freedom of powerful states to use or threaten to use force abroad. The United States’ global power-projection capability provides Washington with a significant strategic advantage: It can protect, or threaten, Iran and any other country on the planet. An Iranian nuclear weapon, however, would greatly reduce the latitude of its armed forces in the Middle East. If the United States planned a military operation in the region, for example, and a nuclear-armed Iran objected that the operation threatened its vital interests, any U.S. president would be forced to rethink his decision. As then-Secretary of Defense Donald Rumsfeld explained in 2001, nuclear weapons “could give rogue states the power to hold our people hostage to nuclear blackmail--in an effort to prevent us from projecting force to stop aggression." This line of thinking is not unique to the situation with Iran. In nearly every historical instance of proliferation, beginning with China in the 1960s, the United States opposed nuclear proliferation in large part because it wanted to preserve its military freedom of action. Indeed, the 2008 National Defense Strategy issued by the Pentagon explicitly states that the American military will achieve its objectives by “shaping the choices of key states, preventing adversaries from acquiring or using WMD, strengthening and expanding alliances and partnerships, securing U.S. strategic access and retaining freedom of action." Some analysts argue that we shouldn’t worry about proliferation in Iran because nuclear deterrence will work, much like it worked during the Cold War. But from Washington’s point of view, this is precisely the problem; it is more often than not the United States that will be deterred. Although Washington might not have immediate plans to use force in the Middle East, it would like to keep the option open. China and Russia, on the other hand, lack the ability to project power in the region. China has recently been recognized as an economic superpower, but its military is still relatively weak. Indeed, military analysts doubt that China could successfully invade Taiwan, a small island roughly 100 miles off China’s coast. Major military operations in the Middle East, therefore, will be out of the question for decades to come. Similarly, Russia lacks a meaningful ability to project power in the region. The Soviet Union was a global superpower, but its military might collapsed along with the Iron Curtain. Russia’s clumsy invasion of Georgia in the summer of 2008 only served to reveal the limits of its military power. In fact, the state of Moscow’s conventional military has sunk so low that Russia’s most recent national security strategy relies heavily on nuclearforces simply to achieve basic defense goals. An Iranian bomb, then, won’t disadvantage China or Russia. In fact, it might even help them. Neither country has hidden its desire to hem in America’s unilateral ability to project power, and a nuclear-armed Iran would certainly mean a more constrained U.S. military in the Middle East. Indeed, at times during the 1980s and 1990s, Beijing and Moscow aided Tehran with important aspects of its nuclear program. While we don’t have detailed information on the motives behind the assistance, we do know that governments don’t export sensitive nuclear technologies for economic reasons alone. Rather, as I show in my forthcoming book, they generally do so in an attempt to hinder their enemies. For example, France helped Israel acquire the bomb in the late 1950s and early 1960s in order to balance against Nasser’s Egypt, and China provided nuclear aid to Pakistan in the 1980s to impose strategic costs on its longtime rival India.It is likely that China and Russia’s nuclear assistance to Iran waspartly intended as a counterweight to American power in the Middle East. Although these countries no longer actively aid Iran’s nuclear program, they may still secretly welcome its development. If any country fails to understand the strategic consequences of a nuclear Iran, then, it is not Russia or China, but the United States. Disproportionately threatened by proliferation, American officials will struggle to convince others to join their fight against the spread of nuclear weapons. They must prepare to live with a nuclear-armed Iran, or, if they cannot do that, they must stop Tehran’s nuclear program themselves. Matthew Kroenig is an assistant professor of government at Georgetown University and the author of Exporting the Bomb: Technology Transfer and the Spread of Nuclear Weapons.